Ask A Hamptons MARKET EXPERT! DESCRIPTION Elegant, luxurious, refined and overlooking the golf course, Welcome to this exceptional home located in premiere Hamptons Estates! A stunning 4+1 bedrooms two storey with over 8200 sqft of living space on massive 0.28 acre pie lot. Built by CalBridge, this mansion boasts open concept with soaring 20 ft ceiling and open to below windows, formal dining room and a home office. Designer highlights includes 9 ceiling, heated tile floors. The extravagant chef's kitchen offers top of line s/s appliances including sub-zero and wolf and granite central island. A curved staircase leads to the 4 spacious bedrooms. the master enjoys private balcony with built-in organizers & heated tile floors & skylight. The other 3 bedrooms finished with walk-in closets; one has private ensuite & the other 2 share a Jack & Jill bath. The professionally finished walk-up basement boasts in-slab heating, huge recreation room and the 5th bedroom. Landscaped west backyard with sprinkler system. Easy access to all amenities. A true gem! Home for sale at 4799 Hamptons WY Nw Calgary, Alberts T3A 6K2. 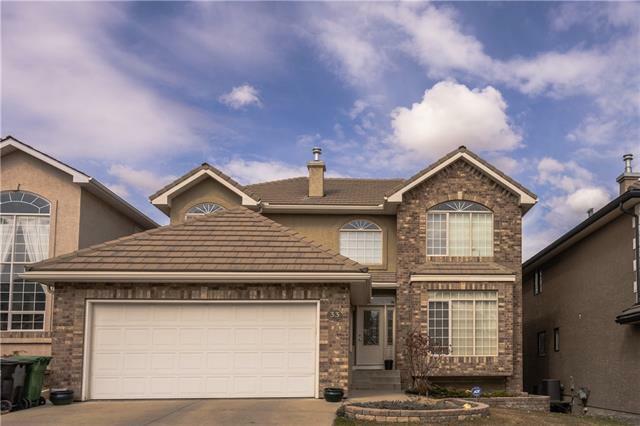 Description: The home at 4799 Hamptons WY Nw Calgary, Alberta T3A 6K2 with the MLS® Number C4202787 is currently listed at $2,380,000.